The world of microplastics contains many confusing terms, so for this article, we decided to discuss two of the most commonly used microplastics: Polyethylene and Acrylates Copolymer. Microplastics have been intentionally added to cosmetic products since the 1960s and are now found everywhere, even in the most remote places on Earth. In the last few years, awareness around the environmental and human health risks increased but we still receive questions about what microplastics are and why they are used in personal care products. Microplastics are very small pieces of plastic that often pollute the environment and are now entering our food chain! Polyethylene is a synthetic thermoplastic polymer made of repeating ethylene units. It is one of the most commonly produced plastics worldwide, with tens of millions of tons produced every year. Polyethylene is one of the most commonly used microplastics in cosmetic products such as eyeliners, mascara, eye shadows, eyebrow pencils, lipsticks, face powders and foundations, as well as skin cleansers and skin care products. Polyethylene has also been largely used for the formation of microbeads. Microbeads are small, solid plastic beads which are intentionally added to cosmetic products for exfoliating, smoothing, or polishing the skin. However, Polyethylene is not added to cosmetic products solely in the form of microbeads. Polyethylene doesn’t always have to be in a visible or solid form. In fact, a great number of cosmetics include Polyethylene in their formula in other forms to provide the product with different types of benefits. Acrylates Copolymer is a general term for synthetic copolymers of two or more monomers consisting of acrylic acid, methacrylic acid or one of their simple esters. Acrylates Copolymer is a substance which is being widely added in cosmetics during recent years. Since the start of the Beat the Microbead campaign, 448 brands promised to remove plastic microbeads from their products – but that does not include all types of microplastics. In fact, since more awareness has been raised around ‘commonly known’ microplastics such as Polyethylene, PET, PMMA, PVC, the use of acrylates copolymer has increased greatly. By taking a quick look at the BTMB database, it can be seen that a minimum of 3 out of 10 personal care products include a variation of acrylates copolymer. What makes the problem even more complicated is that Acrylates Copolymer can form several variations as it can combine with various monomers. For instance, Acrylates Copolymer can be currently found in more than 142 differed unregulated variations! Why are these ingredients added intentionally to cosmetics and personal care products? to unite or bond surfaces together and to hold together the ingredients of a product. to dilute other solids, or to increase the thickness of the lipid (oil) portion of cosmetics and personal care products. It helps to keep an emulsion from separating into its oil and liquid components. to form a thin coating on the skin, hair or nails. in oral care products to polish the teeth, reduce oral odor, or otherwise clean and deodorize the teeth and mouth. to add waterproof properties in makeup products. to set the hair, add body, and protect it from humidity. as an antistatic and suspending agent to hair products. as an adhesive for nail binding products. understanding what these ingredients are and why they are used but also urge you to avoid products that contain microplastics! Beat the Microbead’s “Look for the Zero” quality mark makes clear which products are guaranteed 100% free of microplastic ingredients. 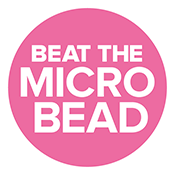 You can also have a look at the list of microplastics to check the products yourself or download the Beat the Microbead app. Sign this petition and tell the EU to ban microplastics in cosmetics!